We know Abraham Lincoln as the 16th president of the United States, but he was more than just a president- he was an example to follow. To me, Abraham Lincoln has earned the status of an American hero as he always kept trying to unite people and put others in front of himself. One time during his childhood, someone asked him to recall anything about the War of 1812, and he said: "Only this- I had been fishing one day and had caught a little fish, which I was taking home. I met a soldier in the road, and having always been told at home that we must be good to soldiers, I gave him my fish." This shows how kind and considerate he was even as a boy. After Lincoln became president he focused on abolishing slavery, for which he establishes the Emancipation Proclamation during his presidency. 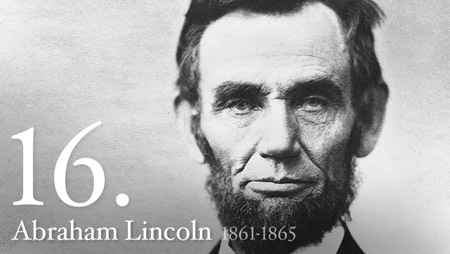 Lincoln is my hero because he said his desire was to be respected and admired by his fellow people as he did. Having been born and raised in Hardin County, Kentucky he grew up on different farms. When he reached the age of 18 he joined the army and eventually became the captain for the Black Hawk War of 1932. After leaving the army he moved to Springfield, Illinois and became a circuit court leader for a while (circuit court leader is someone who goes around a pre-determined area and asks for others' opinion on government). Lincoln was then later promoted too legislator of Illinois for eight years. By the time he married Mary Todd in 1842, he had enough governmental experience and passion to stop the war that he decided to run for president. Lincoln ran against Stephen A. Douglas in 1858 for president but was unsuccessful. This is one of the traits that make him my hero: after he lost his campaign he tried again and with some debating against Douglas, he won the presidency in 1860. Throughout Lincoln's presidency he tried to stop the Civil War using peace instead of violence. Although he was unable to succeed in most of his attempts he still guided and protected the Union as much as possible until the war was over. Lincoln's death from his assassination at Ford's Theater didn't make his works famous or ambitions recognized either; his presidency did. Overall, Abraham Lincoln is my hero because he is someone who put all of his efforts into his work, he put other people's interests in place of his own, and he treated everyone as an equal. "Abraham Lincoln." The White House. Web. 06 Dec. 2011. "Mary Lincoln." Spartacus Educational. Web. 07 Dec. 2011. Picture of Abraham Lincoln. Digital image. The White House. USA.gov. Web. 6 Jan. 2012. "The Boys' Life of President Abraham Lincoln - Biography - A President's Childhood. "Apples4theteacher.com - A Primary Website - Educational Games and Activities for Kids. Web. 07 Dec. 2011.